There is a lot going on with my plant. How do I make sense of it all? In the last Nature’s Notebook Nugget, we gave you some tips on how to wade through the visual chaos that you might see on your plant, to decide on which leaf phenophases to designate as “yes” or “no”. We recommended evaluating each leaf phenophase individually, as many phenophases can overlap with each other. Similar overlapping phenophases will occur when observing and reporting on the Nature’s Notebook’s flower and fruit phe­nophases. Let’s explore these phenophases in Part 2. - Then, make your observation focusing on only what the phenophase definition is describing, disregarding all other activity on your plant, to report your observation. 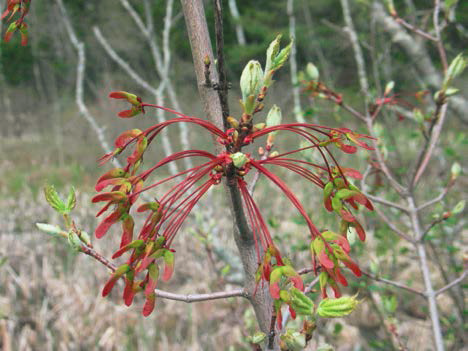 The red maple tree in the image to the left has started leafing out, but also is engaged in other growth activities. Observing carefully, reading the phenophase definitions closely, and focusing one at a time on each separate definition, you would report “Yes” to the phenophases “Breaking leaf buds”, “Leaves”, “Increasing leaf size”, and “Fruits” for this plant (the reddish wishbone-shaped samaras), but “No” to all other Nature’s Notebook pheno­phases for this plant at this visit (“Colored leaves”, “Falling leaves”, “Flowers and flower buds”, “Open flowers”, “Pollen release”, “Ripe fruits” and “Recent fruit or seed drop”). 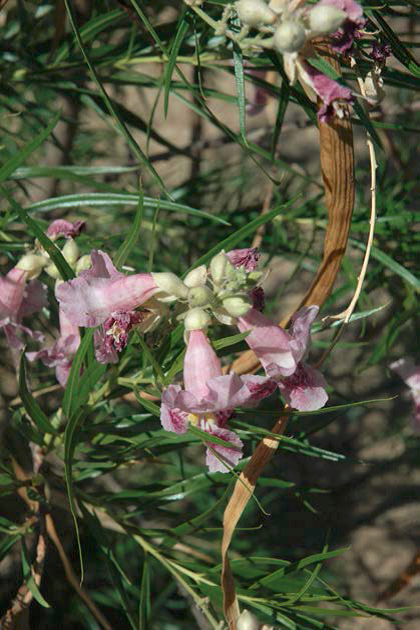 The desert willow tree in the image to the left has mature leaves, but also has other growth activities going on. Observing carefully, reading the phenophase definitions closely, and focusing one-at-a-time on each separate definition, you would report “Yes” to the phenophases “Young leaves”, “Leaves”, “Flowers and flower buds”, and “Open flowers” for this plant, but “No” to all other phenophases for this plant at this visit. Despite having ripe fruit parts remaining on this plant (the long brown pod on the right side of the image), if you read the phenophase definition for “Ripe fruit” for this tree carefully, it is noted that an observer should not count any ripe fruits that have already dropped all of their seeds after the capsule has split open, as this plant has. So, the “Ripe fruit” phenophase would be recorded as a “No”. 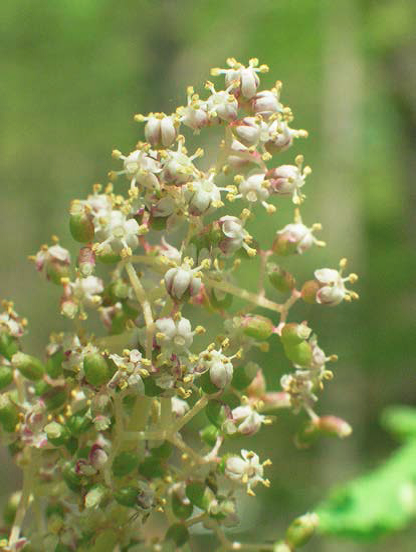 The red elderberry (Sambucus racemosa) flower cluster in the image to the left has opened all of its flowers and has several with­ered flowers, and may also be engaged in other life cycle stages. For species in which flowers are clustered in flower heads, you should still report a "Yes" for flowers as long as there are still some individual flowers in the cluster that have not yet wilted. Observing carefully, reading the phenophase defini­tions closely, and focusing one-at-a-time on each separate definition, you would report “Yes” to the pheno­phases “Flowers and flower buds” and “Open flowers”. For “Fruits”, a seasoned observer might notice that it seems like some of the flower’s ovaries have fertilized and have started developing into fruit (small green globes for this species). Those observers might be able to reliably report a “Yes” if their knowledge of the plant has enabled them to understand what they are seeing is fruit development. For new observers unfamiliar with developing fruit for the plant or those still learning about their plant’s visual cues, there is also the option to report “Not sure”; even for experienced observ­ers, this might be the most accurate choice. Although, this early after flowers are barely wilted, an observer might just go with recording “No” until the visual cues are indisputable. In addition, an observer might place a note in the comments section of the plant data sheet explaining their observation, as needed. Newly developing fruits can be tricky and we understand that different observers will be able to discern the beginning of fruit development at different stages based on their experience with the species. Therefore when analyzing the data, we expect there will be much variation in the actual date that observers start reporting "Yes" for "Fruits". So, more important than catching the very beginning of fruit development is catching the mid- to late stages of development, including ripening. To finish, you would report “No” to all other Nature’s Notebook fruit phenophases for this plant at this visit. Remember, start with what you are comfortable observing. Identify and record observations on the most basic phases first, and when you become comfortable, you can observer even more. Don't be afraid to record a "?" for that which you are unsure. So, take it slow, focus on the definitions, and mostly, enjoy getting to know your plant species as you record Nature’s Notebook’s observations. Happy observing to all of our Nature’s Notebook participants!